Learn Greek Cooking Methods: How are Greek Foods Cooked? Every culture has its own food ingredient favorites, as well as unique cooking styles. If you want to try traditional Greek cooking at home, here are some easy Greek cooking methods that will get you off to a great start. Are you ready? Let’s take a look. Fried foods bring incredible texture and distinctive flavor to foods around the world. But to the Greeks, frying is a culinary art form. Here’s a wonderful Greek fried appetizer dish that’s sure to please even your most finicky guests. Heat olive oil in a deep, cast iron pan. Make sure the oil is hot enough for frying, but not to the point of smoking. Take thick, one-inch slices of Greek cheese (Kefalotyri works great for this recipe), and place them in the hot oil, turning the cheese until all sides are evenly fried – light golden brown. Remove the cheese slices with a slotted spoon, and drain the pieces on a paper towel. Then, toss the cheese wedges in a mixture of freshly squeezed lemon juice, oregano, and capers. Serve warm. Your guests will definitely thank you! Quick, easy, right on the stove top, sautéing offers a flavor-filled cooking method that perfectly suits the Greek table. So, grab your favorite sauté pan and give this Greek vegetate side favorite a whirl. Chop a handful of red onion and garlic, and sauté the pieces in a pan with olive oil. Then add bunches of cleaned, dry, fresh kale. Once the kale wilts in the pan (this will happen quickly), add a squirt of lemon juice and just a sprinkle of coarse salt. This makes a delicious, quick, healthy vegetable side dish. 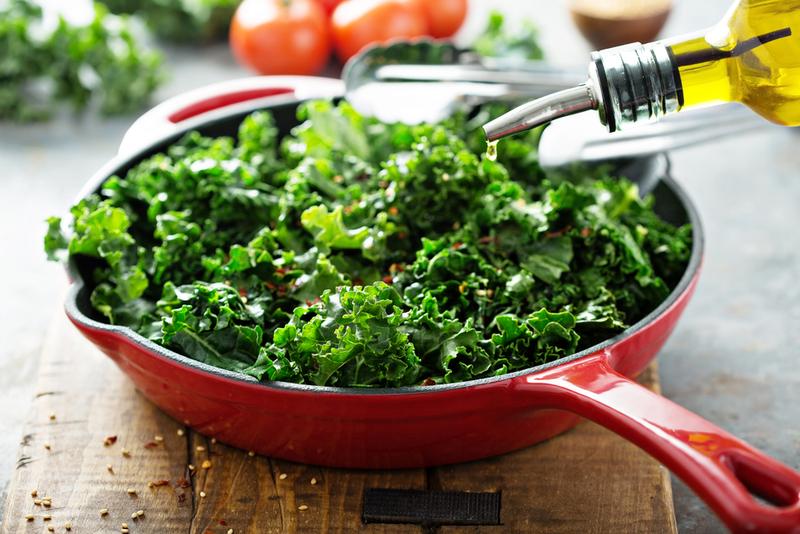 For variation, you can also toss the finished kale in a bowl with crumbled feta, right before serving. Why rush? Stewing Is a great way to create a culinary flavor that’s well worth the wait. Here is an easy way to prepare Greek stewed meal that your guests will truly appreciate. This one’s perfect for a crisp autumn, or winter, night. Chop lamb pieces into large cubes and lightly brown them in a pan on the stove. Then, chop carrots, leeks, garlic, and onions, and set aside. Grab a deep pan and pour a generous amount of olive oil on the bottom. Place all the ingredients into the deep pan and cover with vegetable stock. Add salt, crushed red pepper, oregano, thyme, and a splash of wine. Cover and cook on the stove top, at a low heat, for several hours or until veggies and meat are done. Serve with a tall glass of wine. Delicious! Roasting can be accomplished both in an oven or over an open fire. Roasted foods bring crispness, caramelization, and slow cooked flavors to multiple dishes. Here’s a way to incorporate roasting into your next Greek inspired, family meal. First, preheat the oven to 400 degrees. Then, cut potatoes (red are great for this particular dish) into thick slices. Place them on a cooking sheet, but try not to overlap the pieces. Drizzle the potatoes with olive oil, a splash of lemon juice, coarse salt, and oregano. Toss them so they’re evenly coated. Then, roast the potatoes for about an hour, or until golden brown. Prepared this way, these roasted potatoes are simply amazing, both as a side dish or a stand-alone snack. For authentic Greek foods – prepared with only the finest, quality ingredients – ask for Lemon and Vine products at your local grocery store. For detailed product information, check out our website.